here i come back again! 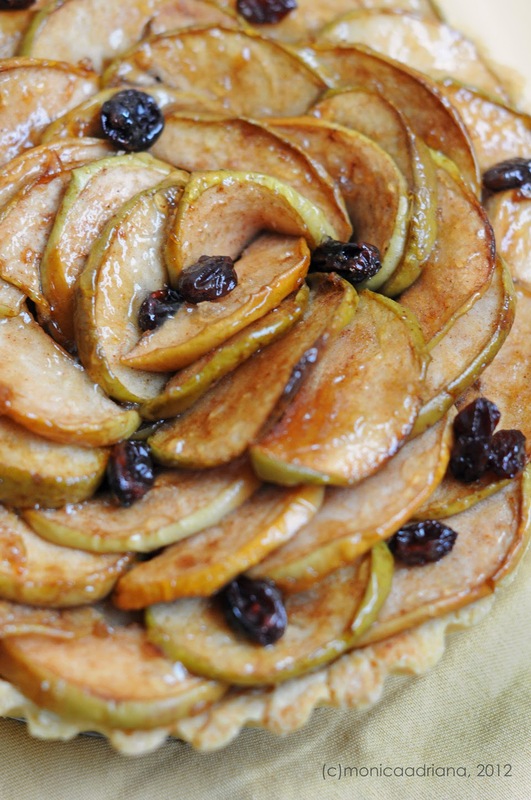 with one of the cake i've planned to bake this week.. french apple tart or if you want something fancy, you can call it 'tarte aux pommes' though i don't really know how to pronounce it. hahaha. turns out, nothing too special about this tart. just like the usual combination with apple and cinnamon. i still like it but it bores me. i was pretty enthusiastic layering those apples until it looks flowery. but i'm not really satisfied with the final look, it's not really neat is it? looks messy :( now, looking at the pictures, i think perhaps it was because i don't peel the apple first. which one do you think? or do you think it's pretty and neat? haha. Confectioners' Sugarfor browning the top of the tart. Preheat oven to 400 degrees F (205 degrees C) and place rack in center of oven. Line the unbaked pastry shell with parchment paper or aluminum foil. Fill tart pan with pie weights or beans, making sure the weights are to the top of the pan and evenly distributed over the entire surface. Bake crust for 20 to 25 minutes until crust is dry and lightly browned. Remove weights and cool crust on wire rack. For Apple Tart: For bottom layer of apples: Peel, core, and slice three of the apples. In a large skillet melt 1 tablespoon (13 grams) unsalted butter and stir in between 2 - 4 tablespoons (25 - 50 grams) of the sugar, the lemon zest, and 1/4 teaspoon cinnamon. Add the apples and saute over moderate heat, stirring occasionally for 7 to 10 minutes, or until the apples are soft. Gently mash the apples with the back of a spatula or spoon and stir the mixture until most of the liquid has evaporated. Remove from heat and let cool. For top layer of apples: Peel, core, and cut the apples into slices 1/4 inch (1/2 cm) thick. Melt 1 tablespoon (13 grams) butter in a large skillet over medium heat and stir in the other 2 - 4 tablespoons (25 - 50 grams) sugar and 1/4 teaspoon cinnamon. Add the apples and saute until they begin to soften, approximately 5 minutes. Set the cooked apples aside. Spoon the applesauce mixture into the cooled pre-baked tart shell. Arrange the apple slices in concentric circles over the applesauce, and brush with 1 - 2 tablespoons (13-26 grams) melted butter. 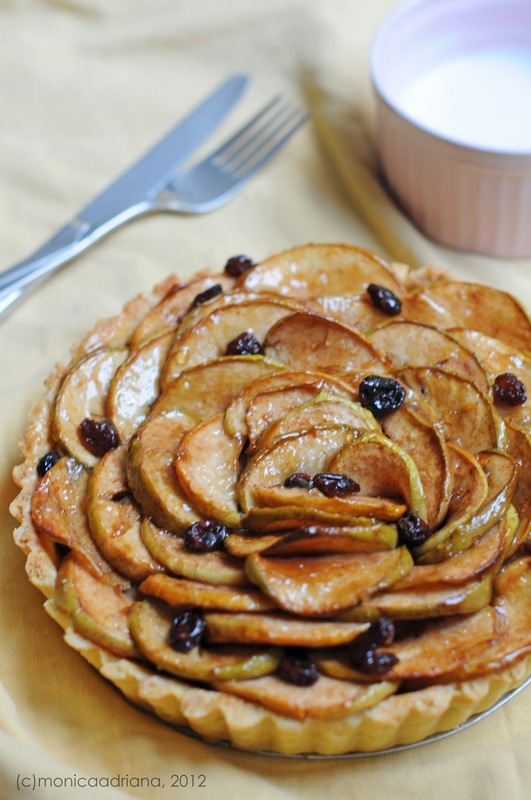 Bake the tart on a baking sheet in a preheated 350 degree F (177 degree C) oven for 25 -30 minutesor until the apples are nicely browned and soft. 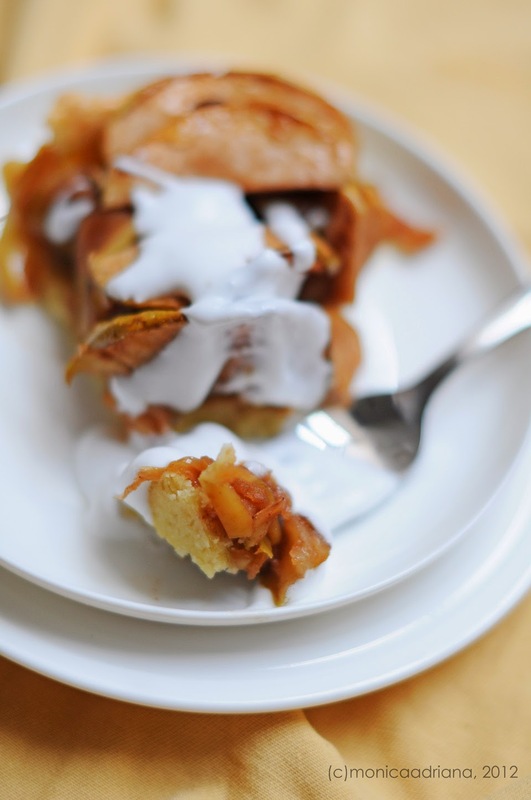 Remove from oven and sprinkle the tart with confectioners' sugar, cover the edges of tart with foil, and broil it under a preheated broiler about 4 inches from the heat until the edges of the apples are golden brown and crisp. Once the tart has cooled lightly glaze the apple slices with warm apricot glaze. Apricot Glaze:In a small saucepan heat the apricot preserves until boiling. Remove from heat and strain to get rid of lumps. Add the Cognac or water. Use this glaze to seal the baked tart shell and to brush the top of the finished tart. it's simple actually even the recipe might be a little long.. I found your site on from another blog. Just wanted to let you know that I subscribed to your feed and can't wait to see what your next post will be. hey CJ! nice to know you, and i'm really honored you subscribed! i've post something new today though it's not quite a recipe.. but next week i will post something so special and i hope you'll like it.. thank you so much! (c) Monica Adriana 2014. Simple theme. Theme images by Jason Morrow. Powered by Blogger.